IIST Admission 2019: Indian Institute of Space Science and Technology (IIST) is situated at Thiruvananthapuram which is a deemed University. It functions as an autonomous body under the Department Of Space, Government of India. Latest Update: Registration for Ph.D. has been started from 18th April 2019. Check the complete Schedule below and fill the application form. Latest Update: Registration for M.Tech has been started from 17th April 2019. Check the complete Schedule below and fill the application form. The Institute gives you a quality education in the field of Space Science, Space Technology and Space Application. It offers you various degrees at Under Graduate; Post Graduate, Doctoral, and Post-Doctoral in the field of Space Research and Development. IIST Admission schedule is divided into 3 parts. It is different for UG Courses, PG Courses, and Ph.D. Courses. Event schedule for all the courses is given below. Candidates have to fulfill all the eligibility criteria to appear in the exam. All the criteria have been listed below; Candidates are advised to take a look on them before filling the application form. Applicant must be the Indian citizen of India. Applicant should have born on or after 1st October 1993 for Gen or UPS and for the ST/SC or PC should be on or after 1st October 1988 IIST Admission Eligibility Criteria. Applicant must have 10+2 with subject Physics, Chemistry & Mathematics. Applicant must qualify the qualifying exam with minimum 75% marks for Gen, OBC, UPS and for ST/SC/PC with minimum 65%. Applicant must qualify JEE Mains and JEE Advanced in 2019. 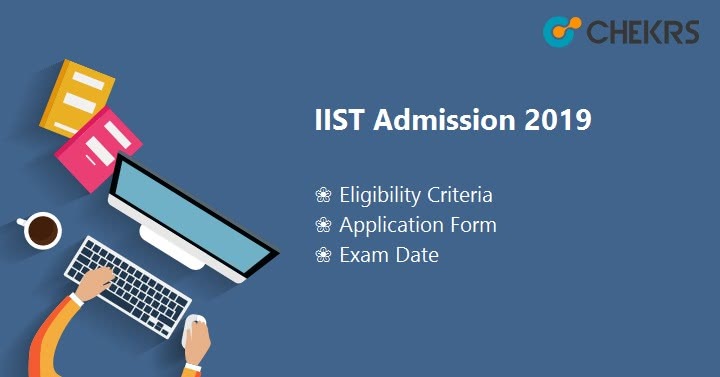 Applicant should born on or after 1st October 1985 For Gen, OBC, UPS and for the ST/SC or PC will get age relaxation on a particular IIST Admission Eligibility Criteria 2019. Applicant must hold B.Tech/ BE/M.Sc./ M.S. or equivalent degree. Applicant must qualify the Degree with minimum 65% marks for Gen, OBC, UPS and for ST/SC/PC with minimum 55%. Applicant must have the qualifying score in the GATE/ JEST/ UGC NET in the relevant area. Final year candidates can apply also. The Application form will be available in the month of April; interested candidates have to complete the registration procedure in between the given time. So after checking your eligibility for the IIST Exam Fill the IIST Registration Form and submit it. The procedure is given below. Candidate should visit the official site of IIST Indian Institute Of Space Science and Technology (IIST) i.e. www.iist.ac.in. The candidate has to fill the IIST Registration/ Application Form through online mode only. Candidates must fill the Personal Details, Education Qualification, JEE MAINS and advanced score (UG), Gate/ JEST/ UGC (PG) Net score. Candidate must upload the signature; thumb biometric, recent Photo with specific dimensions, caste certificate (if applicable). The candidate should pay the fees through Bank challan of State Bank of India or Union Bank of India and fill the details of Bank Challan or upload a scanned copy of Bank Challan in the Application form. Cross verify the detail before submitting the form. Take a print out of the form for the future reference. The IIST Application Fee will be nonrefundable. For Indian Nationality the payment is through Bank Challan from any branch of State Bank of India or Union Bank of India, whereas the payment mode for NRI candidates is DD (Demanded Draft). The DD should be in favor of “REGISTRAR IIST” payable at “Thiruvananthapuram” India. NRI applicant should send DD directly to the address – The Chairman, IIST Admission 2019, IIST, Valiamala (P.O. ), Thiruvananthapuram, 695547, Kerla, India. IIST considers JEE, GATE, JEST, UGC score for the admission. On the basis of score card of these exams, Separate IIST Rank Lists will be also prepared and released. Candidates must have to qualify JEE MAINS and advanced score for UG Courses, and Gate/ JEST/ UGC for PG Courses. On the basis of rank list, Counselling will be held for admission. Candidates have to bring all the original and their photocopy of the documents. After is Seat will be allotted on the basis of Rank List, Seat availability, and category.